It's hard to believe that Arcell Cabuag is celebrating 20 years with Ronald K. Brown/Evidence. He's the company's associate artistic director, and the steady on-stage soul of the troupe. 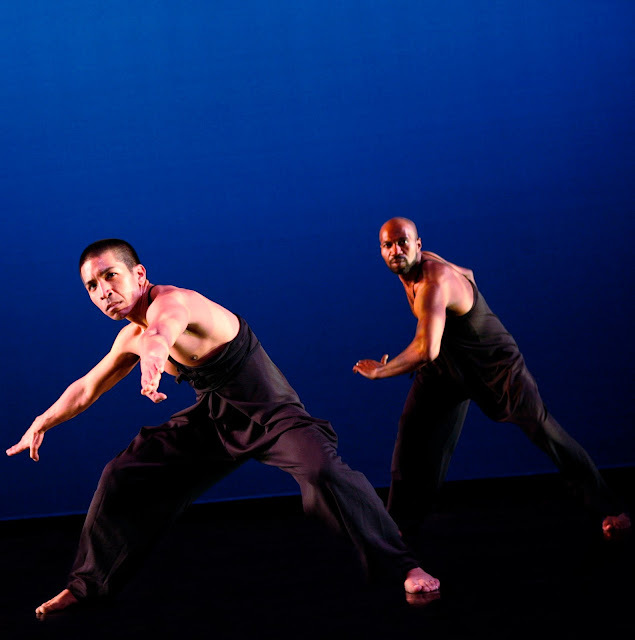 His partnership with Ronald Brown was on display at the Joyce Theater on February 6, in the premiere of Den of Dreams, a duet created in tribute to Cabuag. He entered, slinky and prowling, moving slowly and fluidly. Brown joined him, and they continuously watched one another even as they moved apart and behind one another. At one point, they shook hands at centerstage, affirming to us the strong bond that obviously exists between these collaborators and friends. The program was otherwise a mix of older works (the other programs contained another premiere). In Come Ye (2002), the dancers' feet kept in time to the complex drum rhythms, while the torso and arms elaborated on the darting melodic lines. A repeated motif of clenched fists held aloft signaled a call for unity as the company clustered, split up, and traced the perimeter of the stage. Excerpts from Lessons: March (1995) featured Annique Roberts and Courtney Paige Ross moving to a recording of a speech Dr. Martin Luther King Jr; he said in essence that having money doesn't make you rich, and that there are no superior or inferior races. It's a somewhat futile task to match in movement the power of Dr. King's oration, but Roberts and Ross are both engaging and dynamic presences. The Feb 6 program closed with Upside Down, an excerpt from the 1998 work Destiny. It embodied many of the signature elements for which Brown is known and loved—a relentless, pulsing rhythm delineated through movement; a communal experience marking a passage; and the increase in dynamics to a feverishly ecstatic apex. A recumbent Cabuag is carried off, aloft, by the others; it might mark yet another nod to the decades of service that he has given to the company. And well deserved.